Users of the Tripadvisor website, which provides traveller reviews of all things travel related, have voted Istanbul in Turkey as their favourite holiday destination of 2014. With its fascinating contrasts of ancient and modern, Eastern and Western, land and sea, Istanbul is a feast for the senses. The local cuisine is legendary and the local people are famous for their friendliness and warm welcome. This is a city that has been ravaged by invaders over hundreds of years and been left with a staggering cultural diversity as well as being saturated by the art and architecture of its long term Byzantine and Ottoman inhabitants. Therefore, it is easy to see why this is a favourite destination for Tripadvisor reviewers but what have they voted as the best of the best: the best of Istanbul? Another boldly stated that, “All the buildings we visited were wonderful.” Highlights include the magnificent Blue Mosque; the bustling, colourful and fragrant Grand Bazaar; the grand and impressive Topkapi Palace and the beautiful Hagia Sophia, a basilica turned mosque turned museum. 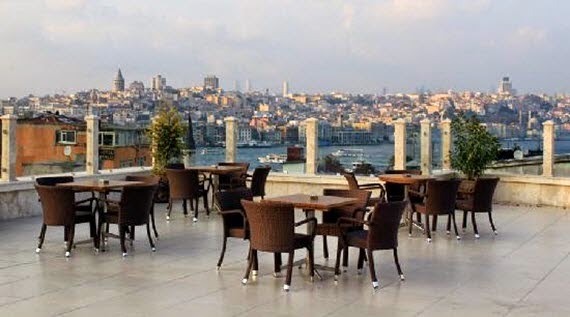 The Neorion Hotel, in the centre of Istanbul, was voted the best place to stay in the entire city. Despite its many interesting features and amenities, such as a swimming pool, Turkish bath, massage spa, cultural library and “museum-quality” decorative arts, the feature that travellers praised most highly in their reviews was the outstanding customer service. In the UK, we have a very different view of what a kebab house is like to the one which has been voted the best place to eat in Istanbul. Like the Neorion Hotel, Gulhane Kebab House has been universally praised for its excellent service and friendly staff. Although not every traveller was wholly impressed by the food, most agreed that it was excellent, with the chicken shish kebab seeming to be a favourite. A recurring theme in the reviews of various features of this Turkish city is the friendliness and helpfulness of the people. Other cities should take note if they want to be voted as Tripadvisor's favourite destination. Oh, how wonderful was that! Thank you for sharing it, too.